California's Mojave Desert is a magical place of rugged mountains, wide open valleys and sweeping vistas. BNSF's former Santa Fe main line from Chicago to Los Angeles crosses this incredible landscape, and we'll see everything from high priority Z trains, intermodals and manifests to grain trains with multiple helper engines, running at speed across the desert, and on their knee's fighting the grades. Superb winter sunshine and lots of trains in magnificent scenery make this a program you won't want to miss! Narration on/off feature. "It is simply the best video photography of contemporary railroading I have ever seen! JF"
"This video is without a doubt the best train video I have ever seen. JJ, CA"
"Your best video yet, great color, great action, great job! WW, IL"
3 hours on 2 DVD's. Widescreen compatible. Marion Charley Mann (Little Mountain, SC) on 2016-01-17 09:07:57. I agree with the other reviews, however if you are looking for diversity of motive power, it's not in this program. At least, 95% of the trains, are with GE wide cabs. If, diversity is your thing, go with CN first, then UP. Texas Hi-Railer (West Texas) on 2012-10-11 13:24:45. I'm just getting caught up on my interviews of several DVD's I've purchased from TVD and I wanted to be sure not to miss this DVD. 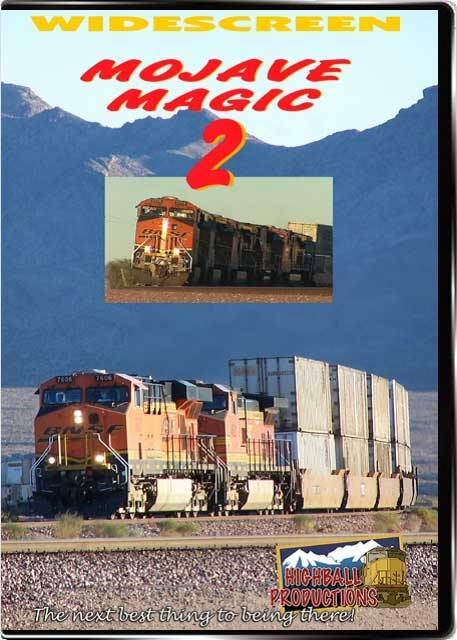 This is one beautiful collection (2 DVDs) of desert railroading you don't want to miss! Some of the early morning shots and many of the sunset shots are simply incredible. It's almost like you're right there watching these trains in action with most of this footage in the DVD collection. The camera really knows his stuff in this video and I strongly recommend this DVD for your collection. This has excellent quality in both imagery and sound. I can't recall watching a better video of desert railroading and I for one am glad I purchased this DVD. You most definitely want this one! TomJ (Kentucky) on 2011-01-08 16:04:09. This is the way it is supposed to be done! BEAUTIFUL! The wide screen format really does the job on this one; it gives the viewer an idea of the vastness of the desert. Terry T in VA. on 2010-03-08 06:28:59.
holding the little Gold Man in their hand!!!!!!!! There is something about mainline action in regions of low population. It's almost majestic. It gives the feeling of just you and the trains. And there is not much else. This video is just that. The Mojave Desert is an interesting location, and Highball has done a fine job showing us the operations of this intriguing location. For those fans who love to see a variety of interesting scenery, this will open the eyes. Watch as trains are so far away, you watch them for a long time before they get close enough to photograph. There is no shortage of action and of the variety of power. Long trains rolling at speed. Interesting locations that really bring out the beauty of the region. An interesting feature is the grade crossings which are powered by solar generators, due to the lack of population, there is not point to point power supply. I really enjoy this video and highly recommend it to all rail fans. It's a "Must Have". I would say that it is one of Highball's finest productions.